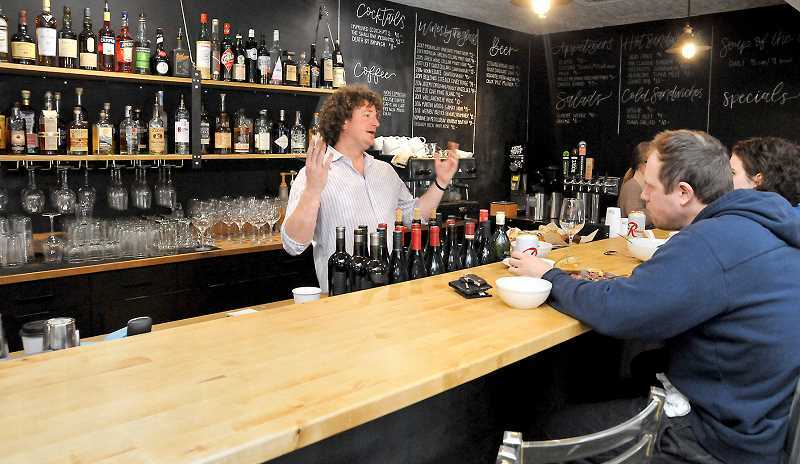 The wide variety of wine tasting rooms in the Newberg-Dundee area will make room for one more as a new wine bar and kitchen on Highway 99W recently opened its doors. Trellis Dundee held its grand opening on March 8 and was open from 7 a.m. to 10 p.m. Friday, Saturday and Sunday, serving Caravan Coffee and light baked goods for breakfast until lunch was served at 11 a.m. Going forward, they will continue operating from 7 a.m. to 10 p.m. every day of the week. Trellis, located at 110 Southwest Highway 99W, will serve wine by the glass and have bottles for sale, as well as beer on tap. They will also serve custom-made cocktails, appetizers, salads and hot and cold sandwiches. According to an application filed with the city, the business will have limited patio hours in the winter and early spring. There will be music, but recorded only and not live, a DJ, karaoke, dancing or games like pool tables or video lottery machines. The building offers seating for 100 patrons, including 42 in the restaurant, eight at a side dining area, and 50 outside. Grant Williams, one-third owner in the business, brings experience in the wine industry and said the goal for the business is to be a family friendly, casual spot that everyone can feel comfortable in either grabbing a drink or staying for a meal. He said all the owners grew up in the area. "The idea behind it is good, casual elemented food, beers, cocktails and wine," Williams said. He added that the owners looked at buildings throughout Newberg and Dundee for the past few years before finding and settling on the Dundee spot. The business is about 1,800 square feet in size, which includes the dining area, side dining area and patio. Williams said they wanted to get moving on it as soon as possible and it had the added draw of having a good dining room, an existing kitchen which they could build out, and nice outdoor area they were able to turn into a patio. "We thought a 40- to 50-seat patio space was huge for this location," he said. Williams added that the location at the corner of Highway 99W and First Street was a draw, since high traffic count on the stretch of road could lead to more customers dropping in. The business' other owners are head chef Joe Jackson and Ethan Headley and Megan Carda, who represent Destination Willamette, a vacation rental business. Williams said the biggest message for potential patrons is that Trellis has a great casual appeal for friends, family, locals and tourists. "It has a great casual family feel," he said. "So drop in. Everything we're doing here is to keep it causal." The owners also plan to add to-go meals and picnic lunches for sale. Williams said the journey from finding the building to opening the doors has been rather quick. They found the building in October, signed the lease in December and have been working inside since January to get everything ready before a soft opening on March 2 and a dinner service March 3 to work the kinks out. "It was an amazing feeling coming in here and seeing the place," Williams said.